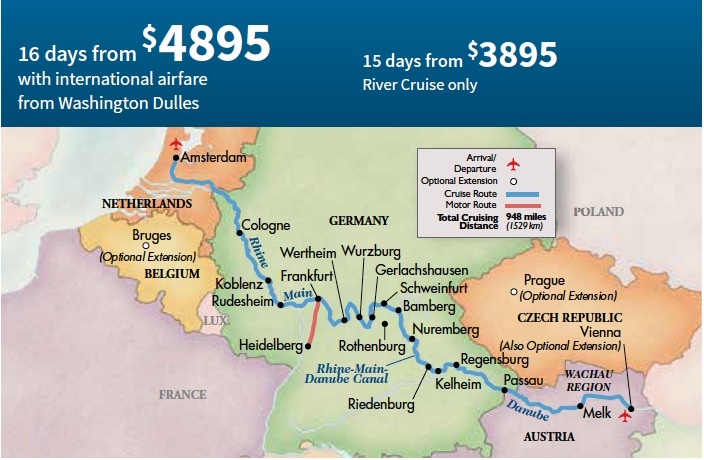 Members of all DC villages are invited to join Foggy Bottom West End Village members, volunteers and friends to cruise through history along the Rhine, Main, and Danube rivers in October 2018 through the Netherlands, Germany, and Austria, uncovering local cultures along the way. See these wonderful sites with people you know and to help support FBWE Village at the same time. You do not have to be a Village member to sign up for this trip. Jane Scholz will be the Village coordinator. Village members, volunteers and friends will contact Grand Circle Travel to book travel and make payments. If more than 10 people join our party, the FBWE Village will receive a donation equal to 10% of the cost of the trip. DO NOTcall the Village office with questions about this trip. Travelers will leave Dulles Airport for Amsterdam on October 14, 2018, and return on October 29. This trip is not suitable for people who use a wheelchair.For more details on physical requirements, read the Physical Requirements section on the GCT.com site. 3. Tell the travel counselor that you want to reserve The Great Rivers of Europe with the Foggy Bottom West End Village. 4.Deposit of $500 per person must be paid when you make your reservation. 5.The recommended Travel Protection Plan is optional. It should be purchased at time of deposit to maximize your coverage.